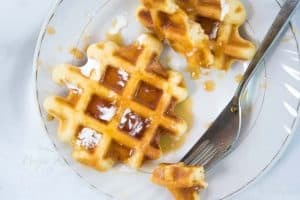 I am sharing eggless waffles, along with waffles made with eggs. What is the difference? and of course the recipe for both. 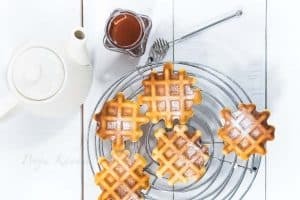 Another interesting part of this post is – What is Belgian Waffle and what is Regular Waffle. What’s the difference? Also some important information about the Waffle Making Machines. And most importantly we will also cover the do’s and don’t of making waffles at home. I tried both the recipes and I can’t deny the fact that the waffles with egg are slightly richer in flavour. There is a tiny difference when we compared the fluffiness of both. But, both the recipes will work well. We often assume waffles that have hight, have deeper pockets and look fluffy are waffles made using eggs. But it’s not true, eggs don’t have a 100% role in giving hight to the waffles. 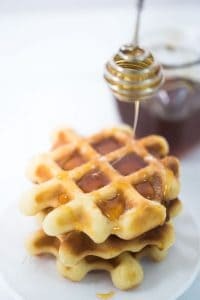 I mean, they do get some percentage of credibility when it comes to fluffiness in waffles but it’s not the only factor involved in the making of good waffles. It’s more to do with the machine you are using. You can achieve a gorgeous looking, absolutely well-made waffles with both the recipes. I will be discussing this point more when we are talking about the best machines and the difference between Belgian and Regular waffles. But the good news is it’s not only eggs … So all those people who follow the eggless diet can have yumlicious eggless waffles any time at home. In one recipe whipped egg whites works, and in another buttermilk when mixed with baking soda works for achieving soft fluffy interiors. 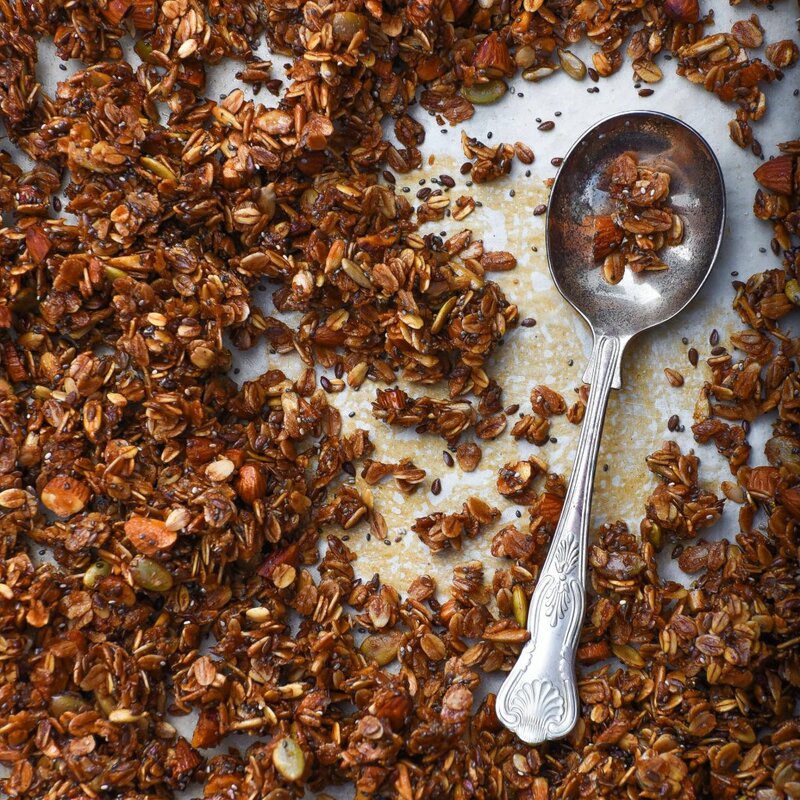 The crunchy exterior can be achieved in both. Deep pockets and the hight can be achieved in both. Here are both the recipes, and if you are wondering, How have I got this shape of my waffles. The answer is, I don’t like to fill my waffle maker to the extreme. Its less than 1/4th cup of batter in the middle of my waffle maker. That way, I have a lot less to clean later, because the batter does not drip out. It also gets enough room to expand and gets an even golden exterior. Preheat a waffle iron according to the manufacturer’s instructions. 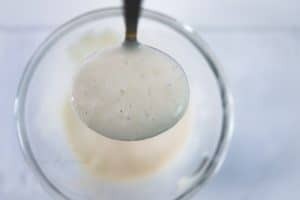 Combine the flour, sugar, potato starch, baking soda, baking powder, and salt in a medium bowl and stir using a balloon whisk to combine. Add the wet ingredients: buttermilk, butter, and vanilla and mix until smooth. Do not over mix otherwise the waffles will be heavy when cooked. 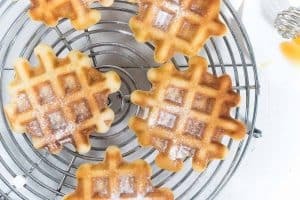 Pour the batter into the waffle iron and cook according to the manufacturer’s instructions, usually for 3 to 4minutes. Serve hot, with your favourite topping. Preheat a waffle iron according to the manufacturer’s instructions. 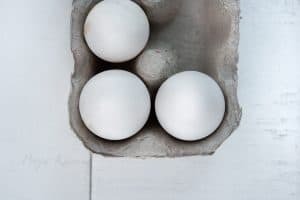 Separate the egg yolks and whites, and beat together the egg yolks, melted butter, vanilla and combine. 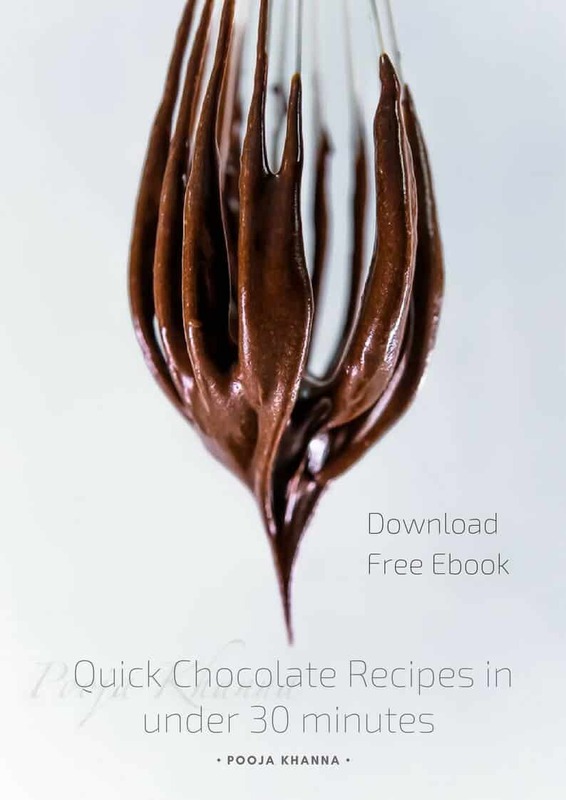 Whisk to combine the flour, potato starch, baking powder, and salt. Set aside. Combine the leftover egg whites with the sugar, and whip to stiff peaks. Stir the egg yolk mixture into the flour mixture and mix well using a wire whisk. Then fold in the egg whites, being careful not to deflate them. 1. Be sure to read the instruction manual for your waffle maker thoroughly. Different waffle makers are designed to cook waffles differently. 2. 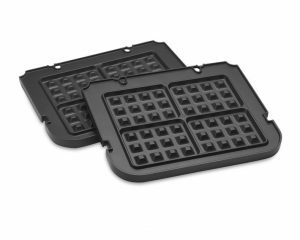 I like to brush oil on my waffle maker both sides before I pour in the prepared batter. The best waffles have fat (a tablespoon per waffle). And you might find this hard to believe, but vegetable oil is better than butter for coating the waffle maker’s grid. 3. It is very important that you preheat the waffles maker. Waffle making is very similar to baking. We are putting the batter into a hot environment and waiting for it brown and rise. Consider hot surface, generous amounts of fat will end up in the irresistible outcome. 4. 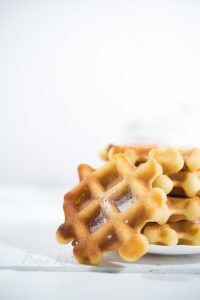 Adding potato starch to cornstarch to the waffle batter protects the waffle from getting soggy from cooking steam. Hence it results in the crisp exterior. 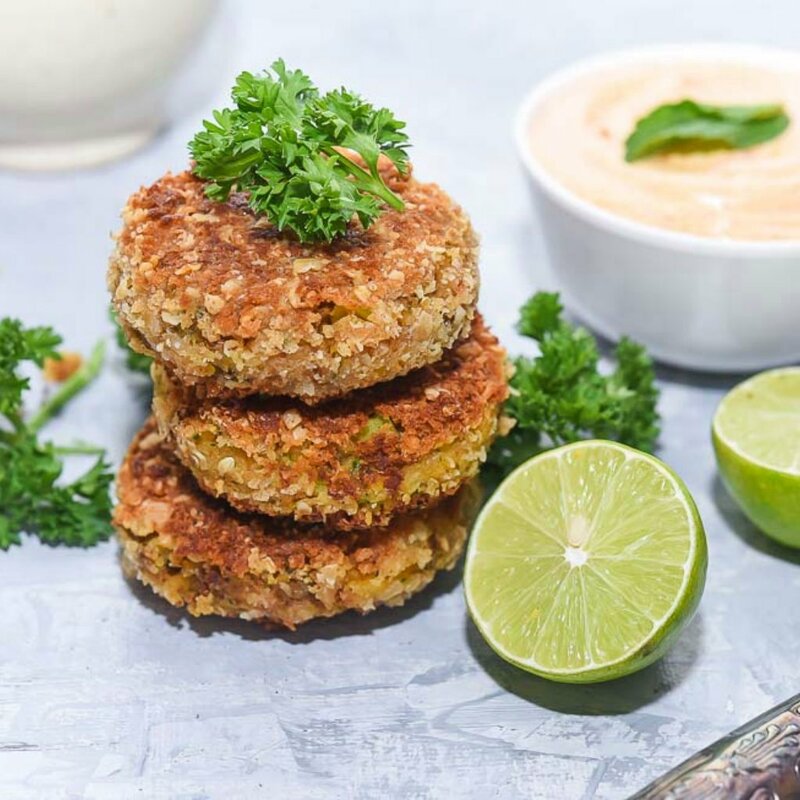 I prefer using potato starch in my recipe more than cornstarch. 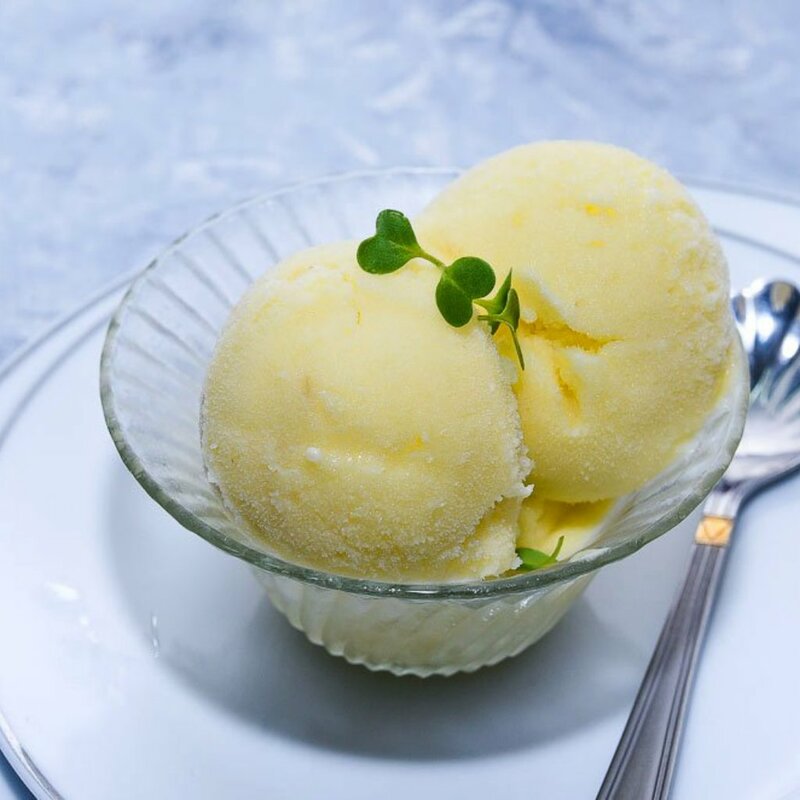 If you are not able to find potato starch, go ahead with cornstarch, consider it as a substitute. 5. If making waffles with eggs, beat the egg whites and sugar into very stiff peaks. Not only does the sugar act as a stabilizer so the whites don’t dissolve as fast, but the sugar creates friction, which softens them, making it easier to fold in later. Additionally, all that air you’re beating in, is going to go into your final waffle batter. 6. 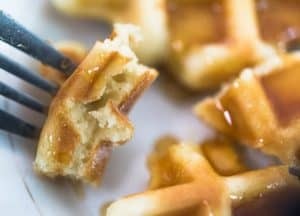 Using buttermilk and baking soda for eggless waffles will result in good waffles. The acidity of the buttermilk plus the baking soda acts as leavening – thus lightness – in the waffles. The important part here is, as soon as the batter is ready, pour it into the preheated waffle maker. Start to make waffles immediately. Don’t let it sit for long. Also, make small batches because the acidic reaction of baking soda will buttermilk starts to die and will end up in less fluffy waffles. 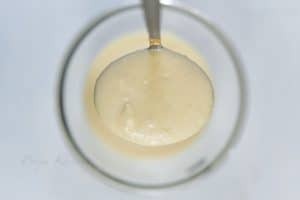 How to make instant buttermilk- add a tablespoon of vinegar or lemon juice to a cup of milk. The acidic ingredient will cause the milk to curdle. Let it stand 5 minutes and there you go ahead and make waffles using the same buttermilk. 7. The first waffle in the machine might go wrong, this happens. Yes, this happens. Considered it as a test to make sure you’re using the right amount of batter and it’s browned to your liking. You will also have an estimation of, what will be the right time to open and check the doneness of waffle. 8. Most of the machines have an indicating light that turns green when waffles are done. Do not lift the lid to check it, or you’ll ruin the waffle. Another way to know that the waffles are done is to notice the steam. Once the steam stops coming out of the side, the waffle should be done. 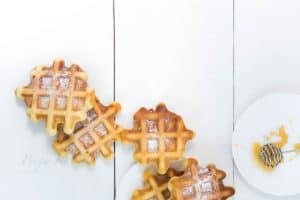 Lifting the lid too soon could cause your waffle to rip, leaving one poor half of a waffle stuck to the top and the other half sadly adhered to the bottom. 9. You can reheat these waffles in the oven. It will keep the waffles warm while you make the rest (so everyone can eat together), the oven actually reinforces the crispiness. To reheat – Set your oven to around 200 degrees F. All the waffles, including the last one, need at least 5 minutes of oven time. Place them directly on the (clean) oven rack in a single layer. Microwave reheating = soggy waffles, so avoid it. 10. You can freeze extra waffles- If you make too many waffles, just place them in a freezer bag after they’ve cooled. 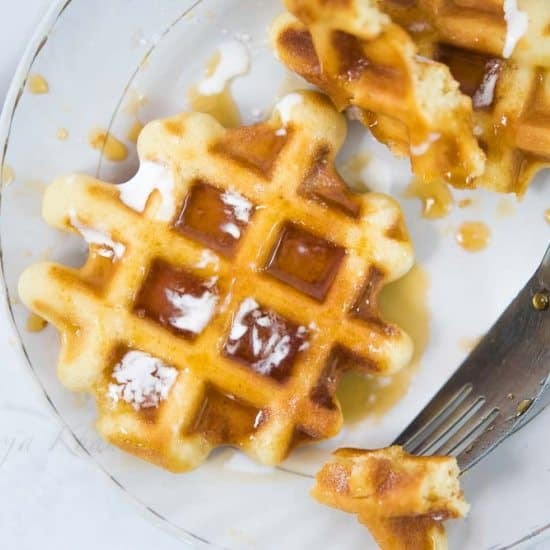 Place wax paper between multiple waffles and squeeze as much air from the bag as possible. When you’re ready to eat them, set out the preferred number of waffles and let them defrost for about 10 minutes. Then, heat the waffles in your oven at 300 degrees for about 5 minutes. Waffles can stay in the freezer for up to 3 months. 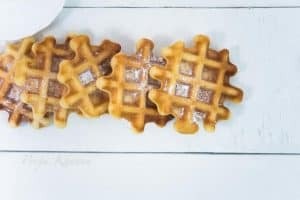 The most noticeable difference between the two types of waffle is that the Belgian waffles are larger in size as compared to the regular waffles. They have high grid patterns, as a result, deeper pockets which makes them great for holding lots of little pools of syrup or chocolate. 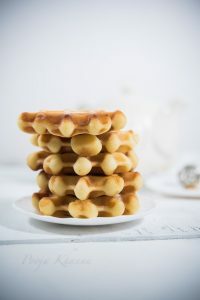 Belgian waffles sold in the market have typically made using a yeasted batter which makes them light and fluffy. Often the yeasted batter sits overnight, making them extra fluffy and light waffles. You get different kinds of waffle makers in the market. The regular one, the Belgian waffle maker, heavy duty for commercial use. 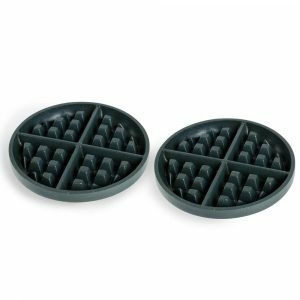 You can use regular waffle batter or eggless batter to the Belgian waffle maker, and you will achieve good results. There are different waffle maker available in the market. It is very important that you considered your requirements before buying one. If you are a real fan and will be using waffle machine often, and I suggest buy a Belgian Waffle Maker. Because, Waffles making require very specific settings, and the compromises you’ll make for a multipurpose device aren’t worth it. However, if you will not be making Waffles regularly, I suggest you can buy this Morphy riched 3 in 1 machine. This works quite well and is worth the cost. Always look for a cast-iron or nonstick model. Whether or not it flips is up to you. 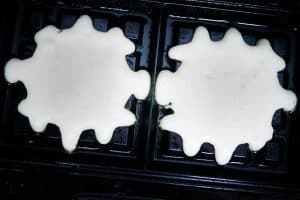 Some swear they get better waffles from a flip model because gravity forces the raw batter into the other side when you flip, and it cooks more evenly. But I guess the quality non-flip model will do the same. Read the directions from cover to cover. This isn’t about safety (though that’s a point to be made); it’s about understanding your tool so you can truly have the perfect waffle. Also, never use metal utensils on a nonstick surface, or you’ll eventually ruin it.